PlusOption is a binary options brokerage brand which is owned and operated by Redfield Markets Ltd. This company is based in Bulgaria and various types of binary options from its web-based and mobile based platforms. 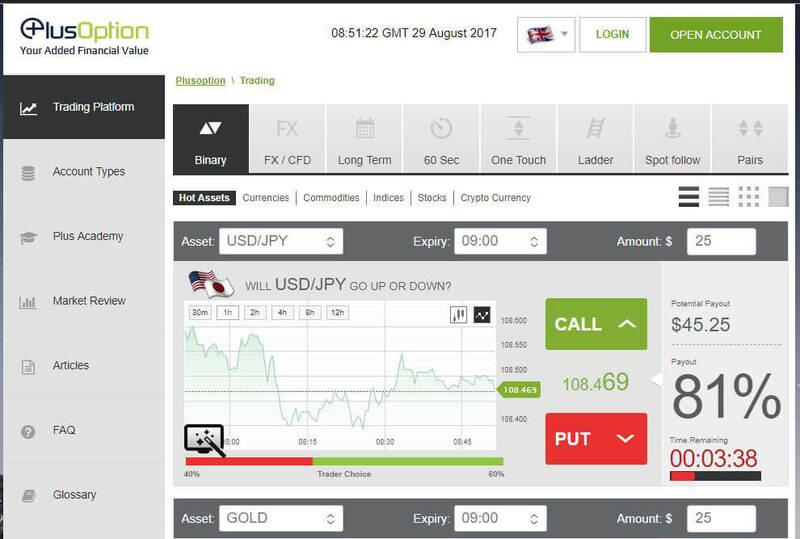 PlusOption is an online brokerage platform which allows traders to trade various types of binary options contracts. The company’s licensing status is unknown at the moment. PlusOption’s primary trading platform is a browser-based version which works across all browsers and does not require any software downloads or installation. The web-based platform is a turnkey rebrand of the SpotOption trading platform. SpotOption has been the undoubted leader in the development of turnkey platforms for binary options brokers since 2009. Several innovative binary options trade types are available for trading as can be seen from the snapshot below. Classical binary option, also known as the Call/Put option. Each trade type is unique and offers traders a wide range of choice as to how to trade binary options. 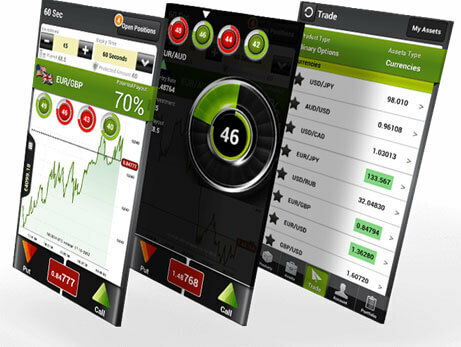 PlusOption also offers traders the option of trading binary options on the go with the use of their mobile apps. These can be downloaded on smartphones and tablet devices from the respective stores: the Google Play store for Android devices and the App store for iPhones and iPads. PlusOption has more than 200 assets listed for trading. Majority of these are stocks. However, stocks are not the only assets that can be traded on PlusOption, as the asset listing shows. Currencies: EUR/NZD, EUR/CHF, EUR/CAD, EUR/AUD, CAD/JPY, BitCOIN(bitstamp), AUD/USD, AUD/NZD, AUD/JPY, AUD/CHF, AUD/CAD, USD/ZAR, USD/TRY, USD/SGD, USD/RUB, USD/JPY, USD/CHF, USD/CAD, NZD/USD, GBP/USD, EUR/USD, EUR/GBP, EUR/JPY. Commodities: Coffee, GOLD, OIL (LIGHT SWEET CRUDE), OIL FUTURE, PLATINUM, SILVER, Sugar, Wheat. Indices: TOPIX, TEL AVIV 25, TADAWUL (SAUDI STOCK EXCHANGE), SSE180 (SHANGHAI STOCK EXCHANGE), S&P 500 (US), RTS (RUSSIAN TRADING SYSTEM), NIKKEI225 (JPN), NASDAQ (US), MSM 30 (OMAN), MICEX 10 (MOSCOW INTERBANK EXCHANGE), KUWAIT (KUWAIT GENERAL INDEX), KL FUTURE, ISE 30 (ISTANBUL STOCK EXCHANGE), HANG SENG (HONG KONG), FTSE 100 (UK), DUBAI (DUBAI FINANCIAL MARKET GENERAL INDEX), DOW (US), DAX (GERMANY), BOMBAY SE. Stocks: YANDEX N.V, YAHOO, WYNN RESORTS, WEIBO, WAL-MART, VOLKSWAGEN, VODAFONE, UNICREDIT, TOYOTA (US), TOSHIBA CORP, TESLA MOTORS, TENCENT HOLDINGS, TELEFONICA, TATA STEEL, SUMITOMO MITSUI, STARBUCKS, SONY, SINA, SIEMENS AG, SAPSAP, SANDISK, SALESFORCE.COM, S.BANK INDIA, ROSNEFT’, RIO-AURIO-AU, Rio Tinto, PROCTER & GAMBLE, PFIZER, PETROBRAS, PEPSICO, PAYPAL, NETFLIX, MICRON. 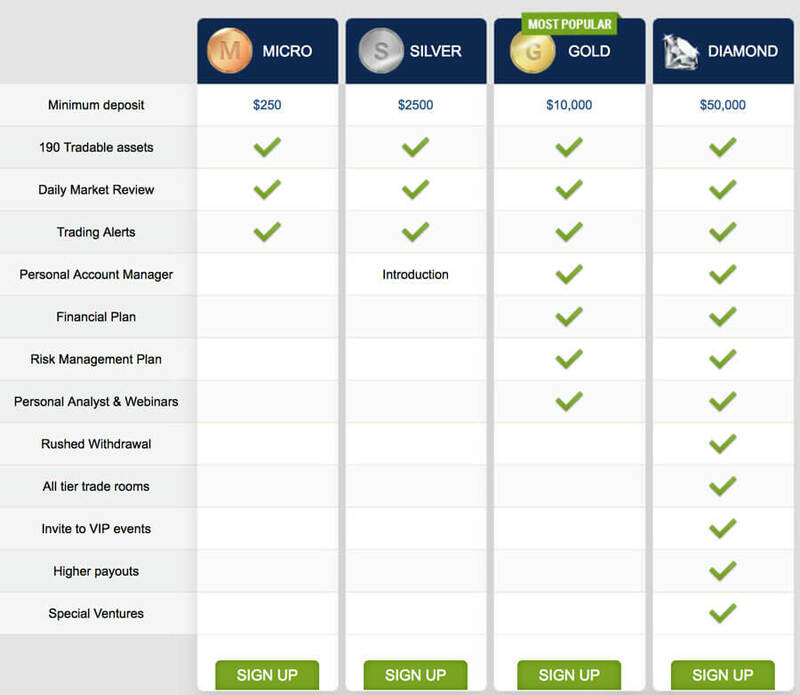 At PlusOption, traders have the opportunity to choose from 4 different account types. These are the Micro, Silver, Gold and Diamond accounts. What do each of these account types offer? When it comes to bonuses, traders get a deposit bonus and gift items under the PlusOption loyalty program. There are also a number of bonuses accessible only to VIP account holders. Accounts on PlusOption can be run in one out of several base currencies: US Dollars, Euros and British Pounds. The minimum deposit amount is $250 (or 250 Euros/GBP). There are also maximum deposit and minimum withdrawal amounts. A minimum of $100 (or 100 Euros/GBP) can be withdrawn. Deposit limits will depend on the method of transaction. With Western Union and credit/debit cards, not more than $10,000 can be deposited at a time. Wire transfers carry no deposit limits. For e-wallets, the deposit limits vary. These are usually clarified by the broker before the deposit is made. When it comes to trading, the maximum amount that can be invested into a trade will vary with the binary option to be traded. For the Classical/Binary, Long term and Pairs options, the maximum investment amount is €/$ 1,500 per trade. For the One Touch Option, there is an investment limit of €/$ 500 per trade. There is also an online contact form. As mentioned earlier, most of the support channels are only available from 8am to 5pm CET (Monday to Thursday) and 8am to 1pm on Fridays. PlusOption offers some great features for its clients. The Double Up function is used to double the investment into an asset if there is belief that current favourable price trends will continue. Traders have more than 200 assets to choose from, giving great flexibility as to what can be traded. There is a vast array of educational resources so PlusOption’s traders can get a grip of how binary options work. Educational resources include materials such as articles, demo videos and a series of webinars. These are all available as part of the Plus Academy. The Roll Over feature is available for traders with out of the money trades to recover them if there is the belief that the trades will turn in the trader’s direction. There are terms and conditions attached to the use of the Roll Over. PlusOption has an impressive product offering. Most of the features are trader-friendly and easy to use. However, there are also areas where vast improvement is needed. PlusOption has a well-diversified asset base. Several exciting trade-protection features such as Double Up, Roll Over and Sell Option. High payouts: 85% for successful option outcome. Transaction volume requirements attached to bonuses are very high (30X bonus amount must be traded to be able to withdraw profits). Only the first withdrawal is free of charge; subsequent ones within a month are not. Customer support is only available for 9 hours a day. Am I qualified to earn bonuses with PlusOption? Answer: PlusOption offers a deposit bonus for first-time traders. This comes with a volume requirement of 30X the bonus for withdrawals to be made. Also, PlusOption features a loyalty program where loyal traders are given physical gift items. What are the payment methods supported by PlusOption? Answer: PlusOption supports the use of credit and debit cards, bank transfers and a few international e-wallets. PayPal is not supported on the PlusOption platform. Answer: The minimum deposit requirement is $/€250. Maximum deposit requirement differs with transaction method, with credit cards and Western union carrying deposit limits of $10,000. Wire transfers have no limits because banks already have very robust Know Your Customer (KYC) policies in place. Answer: Deposit transactions are processed instantly when you use cards or e-wallets. They are slowest with bank wires and Western Union. Withdrawal requests at PlusOption are typically processed in one hour if e-wallets or cards are used to make the transaction. Answer: PlusOption is not regulated. The Bulgarian government does not exercise regulatory control over the binary options market. Can I use a binary options robot on PlusOption? Answer: Binary options robots are third party applications. At the moment, there is no information on any binary options robots that work on the PlusOption platform. Double Up offers you the chance to repeat a winning trade’s conditions. Using the Double Up replicates the same conditions of a winning trade on a new trade, using the current market price. This is a trade protection strategy which allows a trader to sell off a position which is in profits for a reduced but guaranteed profit payout. It usually cannot be used once there are only 5 minutes left to expiration.